After watching a frustratingly clueless, "barbarians at the gate" NewHour segment on campaign smears (which apparently never existed before the Internet and were never spread by the old media) hosted by Gwen Ifill, who also hosts a conventional wisdom synchronization and self-congratulation session known as Washington Week (which I long ago gave up watching), I turned to NYU journalism professor Jay Rosen's PressThink for a more critical view of the old media and, by Jove, I found it in a post called Migration Point for the Press Tribe. Here's how it begins. We are early in the rise of semi-pro journalism, but well into the decline of an older way of life within the tribe of professional journalists. I call them a tribe because they share a culture and a sense of destiny, and because they think they own the press—that it’s theirs somehow because they dominate the practice. Migration—which is easily sentimentalized by Americans—is a community trauma. Pulling up stakes and leaving a familiar place is hard. Within the news tribe some people don’t want to go. These are the newsroom curmudgeons, a reactionary group. Others are in denial still, or they are quietly drifting away from journalism. Many are being shed as the tribe contracts and its economy convulses. A few are admitting that it’s time to panic. Baciu's Memories of Brasov: "Four Eyes"
My first two years of primary school I did at the Saxon school, with Tante Dora Teutsch as my teacher, a kind and gentle soul. I remember that she was the one who observed, while checking my calligraphy in a double-lined notebook for gothic letters, that I had begun to write above and below the lines. That is why I was taken to Doctor Pildner von Steinburg, who diagnosed “juvenile cataracts” in both eyes. Because an operation would follow, we planned to seek consultation in Vienna, which in those days had well-known ophthalmologists, but just then there chanced to arrive in Brasov an ophthalmologist, a professor from Vienna who, being informed of my illness, agreed to see me. He was, I remember, a tall man with a goatee, dressed in black, who examined me at length in a room plunged into darkness in which burned a candle, after which he sat me down before various devices with colored lights. In his opinion, I could be operated on in Brasov, by Doctor Pildner von Steinburg. Thus it was that, at the age of 7 or 8, I was put through two operations and, as one of them failed to produce the results desired, my left eye was operated on once again, in the private sanatorium on Castle Street. Its garden was on the slope of Mt. Tâmpa, in that respect resembling the garden in my home in Honolulu, which I see before me as I write. I remember the devices for testing vision, with moving spots of light, the operating room, the chloroform anesthesia, after which I vomited, full of fear, even though Mother, Father, and the doctor were at the head of my bed. Afterwards I lay in bed, completely immobile, with bandaged eyes, for several days that seemed endless to me. The lights dazzled me once the bandages were removed, but the objects around me had precise contours, as if they were in relief. I wore glasses with thick lenses, and later on my playmates and my classmates at the Andre Muresianu mixed primary school would shout after me, “four eyes,” “bicycle,” or patroski (‘four eyes’), which didn’t particularly hurt me but did separate me from them and, without my realizing it, drew me toward my world of books, of art albums, of various collections that I spent time on, dedicated body and soul to those early passions of my childhood. In September 1976 the Ethiopian People's Revolutionary Party (EPRP), drawing support from the labour unions, teachers and students, all vehemently opposed to military rule, embarked on a campaign of urban terrorism against the Derg and its civilian ally, the All-Ethiopian Socialist Movement, usually known by its Amharic acronym, Meison. An assassination attempt was made on Mengistu in the centre of Addis Ababa in September, the first of nine such attempts. Scores of officials and supporters of the Derg were murdered. The Derg in turn sent out its own murder squads.... By mid-1977 the EPRP was effectively destroyed. In the final phase of the red terror, to establish his own supremacy, Mengistu turned on his Meison allies, destroying them too. The young generation of intellectual activists, who had so avidly supported the revolution were all but wiped out. Mengistu's hold over other parts of Ethiopia was nevertheless precarious. By mid-1977 the Ethiopian army in Eritrea had lost most major towns and controlled little more than Asmara and the ports of Massawa and Assab. In July 1977 Somalia, deciding the time was ripe to take advantage of the Derg's preoccupation with Eritrea and other revolts, launched a full-scale invasion of the Ogaden. By August the Somalis controlled most of the Ogaden. 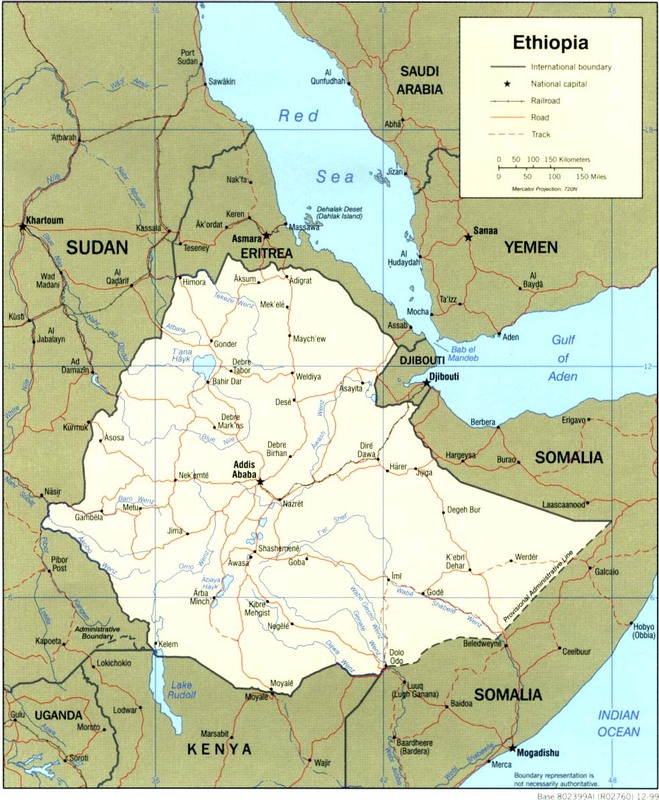 In September they captured Jijiga, an Ethiopian tank base, and pressed on towards the town of Harar and the rail and industrial centre of Dire Dawa, the third largest city in Ethiopia. What rescued Mengistu from military defeat was massive intervention by Soviet and Cuban forces, determined to prop up his Marxist regime. In November 1977 the Soviets mounted a huge airlift and sealift, ferrying tanks, fighter aircraft, artillery, armoured personnel carriers and hundreds of military advisers to Ethiopia. A Cuban combat force numbering 17,000 joined them. Led by Cuban armour, the Ethiopians launched their counter-offensive in the Ogaden in February 1978, inflicting a crushing defeat on the Somalis. The full force of the Ethiopian army, supported by the Soviet Union, was then turned on Eritrea. At the fourth anniversary celebrations marking the overthrow of Haile Selassie in 1978, Mengistu sat alone in a gilded armchair covered with red velvet on a platform in Revolution Square in Addis Ababa watching a procession of army units and civilian groups pass before him. Then he returned to his headquarters at the Grand Palace. Having succeeded in holding the old empire together, he liked to portray himself as following a tradition of strong Ethiopian rulers. Indeed, Mengistu came to be compared with the Emperor Tewodros, a nineteenth-century ruler who started his career as a minor local chieftain, fought his way up to take the Crown and then strove to reunite the empire after a period of disintegration. At official functions at the Grand Palace, while members of the Derg stood respectfully to one side, Mengistu chose to preside from the same ornate chair that Haile Selassie had once favoured. One of his ministers, Dawit Wolde Giorgis, once a fervent supporter of the revolution, recalled his growing sense of disillusionment. At the beginning of the Revolution all of us had utterly rejected anything having to do with the past. We would no longer drive cars, or wear suits; neckties were considered criminal. Anything that made you look well-off or bourgeois, anything that smacked of affluence or sophistication, was scorned as part of the old order. Then, around 1978, all that began to change. Gradually materialism became accepted, then required. Designer clothes from the best European tailors were the uniform of all senior government officials and members of the Military Council. We had the best of everything: the best homes, the best cars, the best whisky, champagne, food. It was a compete reversal of the ideals of the Revolution. He recalled, too, how Mengistu changed once he had gained complete control. He grew more abrasive and arrogant. The real Mengistu emerged: vengeful, cruel and authoritarian. His conduct was not limited by any moral considerations. He began to openly mock God and religion. There was a frightening aura about him. Many of us who used to talk to him with our hands in our pockets, as if he were one of us, found ourselves standing stiffly at attention, cautiously respectful in his presence. In addressing him we had always used the familiar form of 'you', ante; now we found ourselves switching to the more formal 'you', ersiwo. He moved into a bigger, more lavish office in the Palace of Menelik. He got new, highly trained bodyguards – men who watched you nervously, ready to shoot at any time. We now were frisked whenever we entered his office. He began to use the Emperor's cars and had new ones imported from abroad – bigger, fancier cars with special security provisions. Wherever he went he was escorted by these cars packed with guards, with more riding alongside on motorcycles. You get the same result every single time a revolutionary thug promises equality—and begins to deliver it with the help of other revolutionary thugs. Every French Revolution yields a new Robespierre—and then a new Napoleon. My education was, from the beginning, trilingual: Romanian at home, German in my earliest schools, Hungarian with the maidservants, because the latter all came from Szekler villages. Hungarian, I haven’t heard since leaving Brasov in 1937, and I’ve almost totally forgotten it, except for the songs I used to hear in the kitchen or on the Promenade, where we used to go for walks, listening to the city orchestra composed of solemn gentlemen in black jackets and stovepipe hats. Christmases were celebrated at our home, where all the family gathered, but from the morning of Christmas Eve we were sent to my Aunt Jenny, who lived far from us, sometimes on Fork Street (Cuza Voda), sometimes on Postal Orchard. My parents felt bound to resort to this strategy because it was hard for them to restrain me until the arrival of the “Angel.” In those years, Father Christmas didn’t exist in Transylvania, and Saint Nicholas used to come on the evening of the 6th of December. Otherwise, these traditions were scrupulously respected at home. At Easter came the Bunny, with Father making the sound of speedy steps going into the distance, to show that the Bunny had run past our house, leaving behind red eggs and chocolates, mandarins, and oranges. On the 6th of December came Saint Nicholas, with a big sack on his back, with a fur hat over his eyes and a white beard, in whom I believed with a religious intensity until I discovered that he wore the same gaiters as Father, and which he had bought a few days earlier at Lischka. Christmas was, of course, the ultimate celebration, with a tree that reached to the ceiling, mountains of presents (the maidservants would carry theirs off in woven clothes baskets), a huge meal, interrupted by carolers who came down from Şchei hillside, or up from Old Brasov, who ended off with the chorus “To Şaguna High School” before being invited to partake of wine and pound cake. Name days were not celebrated; instead, birthdays had a special importance, with a ritual I still follow today, across decades and continents. Speaking of religious celebrations, I cannot forget Epiphany, when on the Twelfth Night came the archpriest Iosif (Sâvu) Blaga or the priests Nae Stinghe and Furnica, who had baptized me, and was now professor of religion at the “Real School” (Liceul Dr. Ioan Meşota). NOTES: ‘The Grande Dame’ renders doamna maior; ‘stovepipe hats’ renders ţilindru pe cap (usu. cilindru) ‘cylinder on the head’; ‘continents’ renders geografii ‘geographies’; ‘Father Christmas’ renders Mos Crăciun; ‘Epiphany’ renders Bobotează (cf. boteza ‘baptize’); Twelfth Night (= Epiphany) renders Iordanul (the Jordan [River]); archpriest = protopop. I hadn't realized that the Epiphany holidays came to focus on the baptism of Christ (in the Jordan River) among Eastern-rite Christians but on the coming of the Magi among Western-rite Christians. The Wikipedia entry for the holiday contains an interesting observation that may apply to Transylvanians in general: "Hungarians, perhaps because of their location between East and West, celebrate the coming of the Magi, but refer to the celebration as Vízkereszt or "water cross," clearly a reference to baptism." Kenya, 1950s: The Mau Mau Civil War? In postwar years the African population of Nairobi doubled in size. More than half of the inhabitants were Kikuyu, their ranks swelled by a growing tide of desperate, impoverished vagrants. Adding to their numbers were groups of ex-servicemen returning from the war with high expectations of a new life but finding little other than poverty and pass laws. Unemployment, poor housing, low wages, inflation and homelessness produced a groundswell of discontent and worsening crime. Mixing politics and crime, the 'Forty Group' – Anake wa 40 – consisting largely of former soldiers of the 1940 age group who had seen service during the war in India, Burma and Ethiopia and other militants were ready to employ strong-arm tactics in opposing the government's policies and in dealing with its supporters. The trade unions, gathering strength in Nairobi, carried the agitation further, conducting a virulent campaign against the granting of a royal charter to Nairobi. In the African press, too, the tone was becoming increasingly strident. By 1948, the oathing campaign, started by squatters in the Rift Valley and taken up in the Kikuyu reserves and in Nairobi, was in full swing. At fervent gatherings, Kikuyu songs, adapted from church hymns, were sung in praise of Kenyatta and prayers recited to glorify him. In all, several hundred thousand Kikuyu took the oath. The rising temper of the Kikuyu made little impression on the British governor, Sir Philip Mitchell, a solitary, unapproachable figure from the old colonial school, contemptuous of African nationalists, more preoccupied with the recalcitrant white community than with signs of African discontent, and singularly ill-equipped to deal with the crisis unfolding before him. Kenyatta, too, found difficulty in controlling the surge of militancy. He favoured constitutional means to oppose colonial rule but was outflanked by militant activists prepared to use violence. In 1951 a hardened group, including two prominent trade unionists, Fred Kubai and Bildad Kaggia, captured control of the Nairobi branch of the KAU [Kenya African Union], proceeded to gain a virtual stranglehold over the national executive and then formed their own secret central committee with plans for an armed uprising. Kaggia, a former staff sergeant in the army, had seen wartime service in Africa, the Middle East and England. Outbreaks of violence – murder, sabotage, arson and forced oathing – became more frequent. The move towards violence split the Kikuyu people. Both the old Kikuyu establishment – chiefs, headmen and landowners – and the aspiring middle class – businessmen, traders, civil servants and government teachers – opposed violence. So did large numbers of Christian Kikuyu. But by 1952, much of the Kikuyu tribe was caught up in rebellion. As the violence grew worse, with daily incidents.of murder, forced oathing and intimidation, a new governor, Sir Evelyn Baring, on the advice of his officials, concluded that the best way to deal with it was to lock up all KAU leaders. In October 1952, shortly after his arrival, Baring declared a state of emergency and ordered the detention of Kenyatta and 150 other political figures, a move taken by Mau Mau activists as tantamount to a declaration of war. In growing panic, white farmers in the Rift Valley expelled some 100,000 squatters, providing Mau Mau with a massive influx of recruits. Many headed straight for the forests of the Aberdares and Mount Kenya to join armed gangs recently established there. Far from snuffing out the rebellion, Baring's action intensified it. It was only after the emergency was declared that the first white settler was murdered. The brunt of the war, however, fell not on the whites but on loyalist Kikuyu. They became the target of Mau Mau leaders determined to enforce complete unity among the Kikuyu people before turning on the whites. Nearly 2,000 loyalists died. The official death toll of rebels and their supporters was listed as 11,500, though modern researchers put the real figure far higher. Some 80,000 Kikuyu were detained in camps, often subjected to harsh and brutal treatment. As the tide against Mau Mau turned, gang leaders in the forests tried to keep control by employing ever more perverted oaths, horrifying to the Kikuyu and to whites alike. By comparison, the white community escaped lightly. Though white farmers in isolated farmsteads often lived in fear of attack, after four years only thirty-two white civilians had been killed, less than the number who died in traffic accidents in Nairobi during the same period. On the floor below lived Major Mihailescu, who had two children, Mircea and Coca (the daughter had an air I now recognize as Japanese), with whom I didn’t become friends. The major had an orderly he called Zachariah, with whom the maidservant who used to take me for walks had fallen in love, calling him "Zakarias" and singing a pitiful song that ended with the words “Zakarias szép eletem.” One day, the major had a conflict with Mr. Borescu, apparently having to do with the beating of carpets at unauthorized hours. When the insulted concierge leapt up to hit the major, the latter rushed into his house, from which he appeared in a martial pose, brandishing a saber in the air like a fencer, threatening the head of the typographer, who didn’t know how to respond to this unexpected invitation to a duel. I remember that during the 1940s, as a discharged general, Mihailescu was named inspector of the casino in Sinaia. In the back of the courtyard lived Doctor Valeriu Negrila, married to a beautiful Polish woman. I was friends with their daughter, Valerica, while I was little, but later, as often happens, we drifted apart and hardly even greeted each other when I became a “Şagunist” and she a student at the Princess (Elena). One day when I was returning from a walk with the maidservant, I saw two people dressed in white carrying a stretcher on which lay a body covered with a sheet, with locks of black hair hanging out from under it. The maidservant later told me that Valerica’s mother had been found to have “taken poison,” but after a few days I saw her passing through the courtyard with Valerica in tow. I don’t recall the other neighbors, but I cannot forget the entrance hallway in the evenings, with gilded metal bars glittering in the light of the bulbs, and marble veneer shining in a way that seemed fairylike. Just outside the alleyway, on the right and left were two shops: Lischka, men’s clothing; and Books Cooperative Enea, Stinghe, and Ţigoiu, one of whose owners, Professor Sterie (Sterica) Stinghe, had written a few books about the history of Brasov, and whose wife, named Lucia I think, had the habit of strutting around haughty and elegant, the tapping of her high heels audible from far off. I lived on Customs Street, I believe, until around 1928–29, when I finished primary school, thus eight or nine years, maybe ten. The fact is, I cannot recall exactly when we moved from Spitz Palace, just as I cannot remember exactly when we left Prundul Florilor. But I have some vivid memories of the building, which during the early years did not yet have electric lights. I recall those autumn days when Mr. Stroescu, the father of my primary school classmate, Elena Stroescu, used to set up his machine in the Graft Valley, beyond the walls, and cut whole cartloads of wood, which after being chopped up was hauled into the cellar on a kind of wooden stretcher by backwoodsmen hired by the day, who at lunchtime would pull out of their knapsacks “pită şi slană” [bread and fatback, usu. slănină] eating slowly and silently. I recall going with the maidservant to the first silent films I saw at the movie theatre Modern (a wooden shack sitting on the site they later made into the city park), where I enjoyed watching Lia Mara, Maciste, Zigoto, Fatty, Harry Piel, Pat and Patachon, with little Patachonel, and then returning at nightfall to find at the entrance to our apartment dozens of galoshes and overshoes belonging to the “students” at the night classes Father used to teach in the years after unification [of Transylvania and other territories with the Old Kingdom of Romania]: bank directors, officials, attorneys, merchants, who were keen to learn Romanian in those first years of Greater Romania. About that time, Zeidner Books had come out with a grammar of Romanian for foreigners, whose authors were Father and Michael Teutsch. It was a bit slapdash, of a type the Saxons called Zwinkelmisch [lit. ‘twinklemix’], but it sold well and was reprinted several times. After the students left, Father used to amuse himself by telling stories about the mistakes his “students” would make. Carved in my memory are words like “Berger-leţkia” (lecţia) [lesson], or “tratavitele” in place of tratativele [‘negotiations’], which the Hungarians and Saxons had trouble pronouncing, as they did â as opposed to a. Other friends that I remember from the age of 4 or 5, besides Puiu Borescu and Valerica Negrila, were the sisters Takáts, Tony and Baba, somewhat older than me. On the Promenade, where I went with the maidservant, I had “friends” who seemed at that time to be over a hundred years old, if not older: “Old Man Snow,” gone completely white, who talked with me as if I was his age, whom they used to call Cipu (Cipariu) or Ţipu, and who I believe was a judge on “penzie” [pensie ‘pension’]. One “friendship” that my parents did not regard well was that with the doctor of law, Aurel Olteanu, who wore a shiny clip on his tie, patent leather shoes with laces, and a long, sturdy cane, with whose handle he would hook my calf, while glaring at me with bulging eyes and shouting: “I’ve got you, you knave! I’ve got you, you bandit!” To me, the words were amusing, as I knew what bandit meant (Tomescu and Munteanu were famous bandits at the time), but I had no idea what knave [şnapan] meant and my parents showed themselves to be less than enchanted by this “enrichment” of vocabulary. The third “friend” was a little, or rather a short, elderly man, Patruţ Pop, wrapped summer and winter in a long overcoat, something between a blanket and a frock, wearing a black hat, who would stroke my head without saying a word. I vaguely remember having heard that Patruţ Pop was from the family of someone who had played a leading role on the Field of Liberty, at Blaj [in 1848]. As I grew and entered primary school, I lost track of those friends of my early childhood. NOTES: Baciu spelt cearşaf 'sheet' as cearceaf—it's just the difference between English sh and ch. A “Şagunist” is a student at Andrei Şaguna High School. After failing to find clipici in my dictionaries, I translated it 'slapdash' (after considering 'rush job'), despite its relation to a clipi 'to wink, blink' (and its Saxon equivalent, Zwinkelmisch). The hardest phrase to translate in this passage was de moţi tocmiţi cu ziua, which didn't make sense until I found that Moţi designates people from the Western Mountains (Munţii Apuseni) of Transylvania, sometimes known as Ţara Moţilor, known for their pre-Roman features, archaic customs, isolated settlements, and fierce independence—sort of the West Virginians of Transylvania. An explanatory translation like ‘men from Munţii Apuseni hired by the day’ was too long-winded, while 'hillbilly day-laborers' was too pejorative. I almost went with 'itinerant woodcutters’ before settling on 'backwoodsmen'. My sociolinguistics professor in grad school once opined that the best place to learn a foreign language was in a foreign prison. I assume he was thinking of the advantages of a complete immersion environment, total physical response methodology, and very rigorous incentive structures. He must have been at least half serious, because he later applied for a grant to fund an audacious experiment to see what innate linguistic structures might emerge in an isolated, silently administered camp whose workers were recruited in equal numbers from communities speaking languages of a full range of word-order typologies and in minimal prior contact with typologically different languages. I believe the granting agency's Committee on Human Experimentation nixed the proposal, for reasons one can well understand. What makes me recall this is the abundance of fascinating bits of data about foreign language learning in prison that I've been finding in one of the books I'm currently reading, First into Nagasaki: The Censored Eyewitness Dispatches on Post-Atomic Japan and Its Prisoners of War, by George Weller (1907-2002), ed. by Anthony Weller (Three Rivers, 2006). Here are some of the insights of the reporter and the prisoners themselves, arranged under a few general headings. Dark-skinned Junius Navardos (Los Angeles): "Pressure in the mine caused me to pass out once while working. When I came around in the hospital I found myself with burned patches all over my skin. The boys told me that the burns had been made by an American-educated interpreter, Yamamuchi [prob. Yamaguchi], whom we called Riverside because he was brought up there. Asked whether he had done the burning, the interpreter told the doctor, 'Yes, I did this, because I thought he was feigning.'" African societies of the pre-colonial era – a mosaic of lineage groups, clans, villages, chiefdoms, kingdoms and empires – were formed often with shifting and indeterminate frontiers and loose allegiances. Identities and languages shaded into one another. At the outset of colonial rule, administrators and ethnographers endeavoured to classify the peoples of Africa, sorting them out into what they called tribes, producing a whole new ethnic map to show the frontiers of each one. Colonial administrators wanted recognisable units they could control. 'Each tribe must be considered as a distinct unit,' a provincial commissioner in Tanganyika told his staff in 1926. 'Each tribe must be under a chief.' In many cases, tribal labels were imposed on hitherto undifferentiated groups. The chief of a little-known group in Zambia once ventured to remark: 'My people were not Soli until 1937 when the Bwana D.C. [District Commissioner] told us we were.' When local government was established under colonial rule, it was frequently aligned with existing 'tribal areas'. Entirely new ethnic groups emerged, like the Abaluyia or Kalenjin of western Kenya, formed from two congeries of adjacent peoples. Some colonial rulers used tribal identities to divide their subjects, notably the British in southern Sudan and the French in Morocco. Chiefs, appointed by colonial authorities as their agents, became the symbol of ethnicity. Missionary endeavour added to the trend. In the process of transcribing hitherto unwritten languages into written forms, missionaries reduced Africa's innumerable dialects to fewer written languages, each helping to define a tribe. The effect was to establish new frontiers of linguistic groups and to strengthen the sense of solidarity within them. Yoruba, Igbo, Ewe, Shona and many others were formed in this way. Missionaries were also active in documenting local customs and traditions and in compiling 'tribal' histories, all of which were incorporated into the curricula of their mission schools, spreading the notion of ethnic identity. African teachers followed suit. In southern Nigeria, young men from Ilesha and Ijebu who attended school in Ibadan or Oyo were taught to write a standard form of the Yoruba language and to identify themselves as Yoruba – a term previously reserved for subjects of the Oyo empire. As mission stations were largely responsible for providing education, educational achievement tended to depend on their locality and thus to follow ethnic lines. Migration from rural areas to towns reinforced the process. Migrants gravitated to districts where fellow tribesmen lived, hoping through tribal connections to find housing, employment or a niche in trading markets. A host of welfare associations sprang up – 'home-boy' groups, burial and lending societies, cultural associations, all tending to enhance tribal identity. Certain occupations – railwaymen, soldiers, petty traders – became identified with specific groups which tried to monopolise them. It was in towns that ethnic consciousness and tribal rivalry grew apace. The notion of a single Igbo people was formed in Lagos among the local 'Descendants' Union'. The Yoruba, for their part, founded the Egbe Omo Oduduwa – a 'Society of Descendants of Oduduwa', the mythical ancestor of the Yoruba people; its aim was 'to unite the various clans and tribes in Yorubaland and generally create and actively foster the idea of a single nationalism throughout Yorubaland'. Ethnic groups became the basis of protest movements against colonial rule. In the first elections in the postwar era in Africa, nationalist politicians started out proclaiming nationalist objectives, selecting party candidates regardless of ethnic origin. But as the number of elections grew, as the number of voters expanded, as the stakes grew higher with the approach of independence, the basis for campaigning changed. Ambitious politicians found they could win votes by appealing for ethnic support and by promising to improve government services and to organise development projects in their home area. The political arena became a contest for scarce resources. In a continent where class formation had hardly begun to alter loyalties, ethnicity provided the strongest political base. Politicians and voters alike came to rely on ethnic solidarity. For politicians it was the route to power. They became, in effect, ethnic entrepreneurs. For voters it was their main hope of getting a slice of government bounty. What they wanted was a local representative at the centre of power – an ethnic patron who could capture a share of the spoils and bring it back to their community. Primary loyalty remained rooted in tribal identity. Kinship, clan and ethnic considerations largely determined the way people voted. The main component of African politics became, in essence, kinship corporations. The formation of one ethnic political party tended to cause the formation of others. In Nigeria the National Council of Nigeria and the Cameroons, the first modern political organisation in West Africa launched in 1944, started out with the aim of establishing a broad-based national movement, but after tribal dissension it became an Eastern regional party, dominated by Igbo politicians. Yoruba politicians left to form the Action Group, building it around the nucleus of Egbe Omo Oduduwa. In Northern Nigeria, the Hausa-Fulani, while disdaining the nationalist cause which Southerners espoused, nevertheless formed in 1949 the Northern People's Congress as a political offshoot of a predominantly Hausa cultural organisation, Jam’yyar Mutanen Arewa – Association of the Peoples of the North. In a more extreme example, in the Belgian Congo rival tribal parties were launched by the score. In most countries, political leaders spent much time on 'ethnic arithmetic', working out alliances that would win them power and keep them there. Few states escaped such divisions. In Tanganyika, Julius Nyerere was helped, as he himself acknowledged, by the fact that the population was divided among 120 tribal groupings, none of which was large enough or central enough to acquire a dominant position. He benefited too from the common use of the Swahili language, spread initially by Arab traders, then taken up by the Germans and the British as part of their education system. Other states had to contend with a variety of languages, sometimes numbering more than a hundred. In all, more than 2,000 languages were in use in Africa. There was a widespread view at the time of independence that once the new states focused on nation-building and economic development, ethnic loyalties would wither away under the pressure of modernisation. 'I am confident', declared Nigeria's first prime minister, Abubakar Tafawa Balewa, during a 1959 debate over the motion to ask for independence, 'that when we have our own citizenship, our own national flag, our own national anthem, we shall find the flame of national unity will burn bright and strong.' Ahmed Sékou Touré of Guinea spoke in similar terms in 1959. 'In three or four years, no one will remember the tribal, ethnic or religious rivalries which, in the recent past, caused so much damage to our country and its population.' Yet African governments were dealing not with an anachronism from the past, but a new contemporary phenomenon capable of erupting with destructive force. It doesn't seem all that different in kind, only in degree, from what happened in Europe with the spread of vernacular literacy, Protestantism, historical and comparative linguistics, and the scientific subclassification of everything and everyone on earth—and what continues apace in modern universities, prisons, and other political/protective patronage networks that privilege race/ethnicity over social class, religion, or other more mutable cross-cutting categories. NOTE: Baciu's adjective describing the Austro-Hungarian monarchy, chezarocrăiască, gave me a lot of trouble. I couldn't find it anywhere until I tried its masculine singular form, which is more commonly rendered as cezaro-crăiesc, equivalent to German kaiserlich-königlich, lit. 'imperial-royal', respectively describing the Austrian and Hungarian thrones. As an educated Transylvanian, Baciu's Romanian is sometimes Germanified. For instance, he says that in high school his friends called themselves ştudenţi, with a German sh, and not studenţi as in standard Romanian. That may be why he rendered cezar 'caesar, emperor' as chezar 'Kaiser'. The Romanian translation of königlich in this construction comes from crai, a Slavic term for 'prince' that is nowadays especially common in fairy tales (basme), as is its feminine equivalent crăiasă 'princess'. NOTE: I've translated Prundul Florilor, the former name of a street in Brasov, as 'Bank of Flowers', since the primary meaning for prund seems to be 'gravel' or 'gravelly bank of a river'. But the German name for the same street in Brasov was Rosenanger 'Rosemeadow' (or 'Rosedale'?). Better suggestions are welcome. American and Chinese prisoner coal miners emerging from underground darkness in central Kyushu are discovering for the first time that their prison camps are adjacent. For nearly one month since the surrender the Chinese have been going foodless because their Japanese guards have departed from the camp. Their serious medical condition was discovered today by two parties headed by American doctor Captain Thomas Hewlett, of New Albany, Indiana, and Crystal River, Florida, who was captured on Corregidor, and Australian Captain Ian Duncan, of Sydney, captured in Singapore. B-29s today dropped the Chinese their first food supplies since the surrender. Hewlett reported that the nearest Chinese camp commander is a remnant of a party under American-trained Airman Lieutenant Colonel Chiu, which left North China two years ago, then numbering 1,236. Three hundred men died on reaching Japan. The Japanese never provided a camp physician and the Chinese have none. Thus in the Chinese camp every man regardless of condition has been considered by the Japanese fit for underground work. Fifty are seriously ill, about half of these with deficiency disease. This Chinese camp counted 70 men killed by Japanese guards in two years, plus 120 dead of disease, with 546 still living. The other coal miners' camp of Chinese consists of what remains of 1,365 who left China eighteen months ago; 54 have been executed or otherwise beaten to death by the Japanese, and 60 died of mining injuries. Many of the surviving Chinese are ''as thin as skeletons," with bandages made of rags or newspapers. The camp has one Chinese doctor who possesses neither a scalpel, forceps, thermometer nor stethoscope. Both those Mitsui mines worked by Americans and those worked by Chinese are defective, "stripped" mines, dangerous to operate because their tunnels' underpinnings have been removed to obtain the last vestiges of coal. Another Chinese camp is known to exist somewhere in Kyushu and is being sought by a party headed by Medical Warrant Officer Houston Sanders, of Hartwell, Georgia. At the core of the crisis was cocoa money. To protect cocoa farmers from price fluctuations, the colonial authorities had established a Cocoa Marketing Board (CMB) which each year fixed a guaranteed price for farmers and acted as the sole buyer, grader, seller and exporter of cocoa. Once in office, Nkrumah instructed the CMB to keep the price as low as possible, aiming to raise funds for development projects. But the CMB soon became notorious for corruption and mismanagement; it was regularly exploited to distribute credit, contracts, commissions, licences and jobs to CPP [Convention People's Party] supporters. An official investigation revealed that the CPP used a CMB subsidiary to enrich the party's coffers, to coerce farmers into joining the party and to control petty commerce. Soon after the 1954 election, Nkrumah announced that the price paid to farmers would be fixed for a period of four years at a level less than one-third of ruling world prices. This decision provoked a surge of anger across Asante, the central forest region where half of the country's cocoa crop was grown. Not only farmers but cocoa traders, merchants and businessmen based in the Asante capital, Kumasi, resented the loss of income. A new opposition party, the National Liberation Movement (NLM), sprang up, proclaiming to defend Asante interests and culture against a central government it portrayed as corrupt, dictatorial and bent on undermining the beliefs and customs of the Asante people. With the blessing of the Asante paramount chiefs and backed by fervent support in the Asante heartland, the NLM demanded a federal constitution prior to independence, giving Asante and other areas that wanted it a substantial measure of local autonomy. No other African state was launched with so much promise for the future. Ghana embarked on independence as one of the richest tropical countries in the world, with an efficient civil service, an impartial judiciary and a prosperous middle class. Its parliament was well established, with able politicians in both government and opposition. The prime minister, himself, then only forty-seven years old, was regarded as a leader of outstanding ability, popularly elected, with six years of experience of running a government. The country's economic prospects were equally propitious. Not only was Ghana the world's leading producer of cocoa, with huge foreign currency reserves built up during the 1950s cocoa boom, but it possessed gold, timber and bauxite. The Far Outliers spent last weekend in the stormy Wisconsin Dells, celebrating my mother-in-law's 80th birthday with a small family reunion in a cabin at Cedar Crest Lodge on the Wisconsin River, just off Sauk County Highway A, barely half a mile from where Lake Delton cut a new path (or widened an old path) across the highway into the river. When we tried to drive out down Highway A last Monday, we were turned back by policemen at the floodpath who told us to head back uphill to Bunker Drive, which we had heard was partially washed out the previous night when part of the family drove back to Madison. We got away at 6 a.m., stopped in tiny DeForest, WI (home of the Pink Elephant), to refill our rented Camry's near-empty gas tank for $57.50 (@ $3.96/gal., the cheapest we found) and to have a good, meaty breakfast at DeForest Family Restaurant, and managed to return the car to O'Hare by 10:30 a.m., in ample time for our flight out. That one full tank took us from O'Hare to the Dells and back, and from the Dells to Dane County Regional Airport and back to pick up our daughter on Saturday, the day when all hell broke loose. Soon after Miss Outlier and I returned, the sky darkened, the wind kicked up, the power went out, and the manager came around to announce a tornado warning and advise us to seek shelter in the exercise lodge, which had windowless concrete block walls in two long, narrow restrooms on the ground floor. That warning period lasted about an hour. Not long after it ended, we heard sirens again, and spent another half hour watching tree branches fall to the ground and getting to know our few neighbors a bit better. Fortunately, the wind and rain let up a little and the power came back on by the time the last of our party arrived from Madison for dinner, which featured brats, burgers, grilled veggies, salad, and a birthday cake with 80 candles (unfrosted except for some residue of candlewax on top). Friday had been clear enough for us to drive down through Baraboo to Devil's Lake and hike halfway up a rock face to a balanced rock. And Sunday was clear enough for me to walk a mile or so up Highway A to take a picture of the now rather beachless Aloha Beach Resort & Suites. The highway was crisscrossed with trails for Wisconsin Ducks, vehicles that have aided rescue efforts in many flood conditions, including yeoman work in New Orleans in the wake of Hurricane Katrina. For much of our time around the cabin, the Ducks would pass us going up Hillside Drive, but we saw one or two rush back downhill just after the tornado warnings. UPDATE: On the way to and from Aloha Beach Resort, I passed some interesting gateways and an historical marker, which I'll reproduce here. 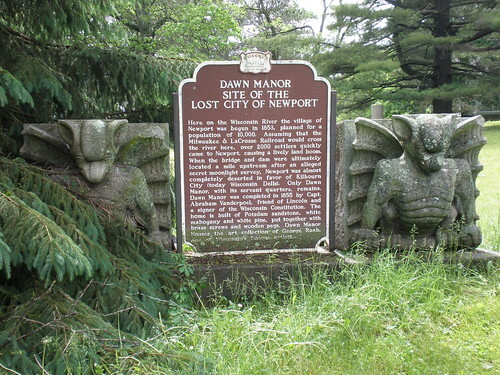 Here on the Wisconsin River the lost village of Newport was begun in 1853, planned for a city of 10,000. Assuming that the Milwaukee & Lacrosse Railroad would cross the river here, over 2,000 settlers quickly came to Newport, causing a lively land boom. When the bridge and dam were ultimately located a mile upstream after an alleged secret moonlight survey, Newport was almost completely deserted in favor of Kilbourn City (today Wisconsin Dells). Only Dawn Manor, with its servant quarters, remains. Dawn Manor was completed in 1855 by Capt. Abraham Vanderpoel, friend of Lincoln and a signer of the Wisconsin Constitution. The home is built of Potsdam sandstone, white mahogany, and white pine, put together with brass screws and wooden pegs. Dawn Manor houses the art collection of George Raab, one of Wisconsin's famous artists. More on Dawn Manor and the aftermath of the flooding and drainage of Lake Delton can be found at random blonde thoughts. So why were the Comanches so exceptional among American Indians? Pekka Hämäläinen, a Finnish scholar of the American West, currently at the University of California, Santa Barbara, argues that, like the Iroquois, the Comanches were fortunate geographically, since their heartland was at once central and peripheral, and at the intersection of Spanish and Anglo spheres of influence. They were inventive and flexible, using a nuanced division of labour in everyday life and operating a dual economy of hunting and pastoralism; they had a unique ability to make use of the horse; and their culture enabled them to incorporate change better than other Indians. They depended on two animals, the horse and the bison, which in the early days were present on the Great Plains in vast numbers. They had 120,000 horses in their herds and access to another two million wild ones. By some indices the Comanches reached the apex of their power at just the moment, in the 1840s, when they began to collide with the US expansion westwards. Actually, smallpox and other diseases had already brought the Comanche population down to 20,000. And a whole host of factors seriously weakened them even before they inevitably came to blows with white settlers and the US government. Essentially the Comanches were overstretching their resources and habitat. They were killing more than 280,000 bison a year - the maximum loss the herds could sustain without imploding - and at the very time the great drought of 1845-50 was exacerbating the situation. Even worse, bison and horses were in competition for the same pasture and water, and if the bison moved farther west to new grasslands, they found these occupied by the sheep and shepherds of New Mexico. On the other hand, if the Comanches cut their horse numbers, they also cut down their military capacity. As everyone except a handful of Native American fundamentalists now accepts, the bison herds were in terminal decline even before the arrival of white hunters. There had originally been seven million 'buffalo' on the southern plains but by the 1860s, before the frenzy of the white bison hunters, half of these had already been killed by the Indians. Put simply, by the end of the 1840s there were too many Comanches raising too many horses and hunting too many bison on too small a land base. The writing was on the wall in other ways, too. While Comanche numbers had declined to 10,000 by 1850, the population of white Texas rose from 140,000 in 1847 to 600,000 by 1860s. Meanwhile, Arapahos and Cheyennes, pushed west by the expanding power of the Lakota, began encroaching on the Comanche heartland. The end came suddenly. Faced with a shortage of bison, having lost access to firearms, maize and garden produce, and been forced to relinquish control of the long-distance trade routes into Mexico and across the Great Plains, the Comanches began literally to starve to death and in their weakened state to become prey to cholera, smallpox and other deadly diseases. In this terminal crisis, at the end of the 1850s they were engaged in warfare on three fronts, against the Fox Indians, the Texas Rangers and the Spanish buffalo hunters of new Mexico. Driven out of Texas by 1859, the Comanches were abruptly handed a lifeline when the American Civil War erupted. By 1865, with Texas on the losing side, the end of the drought on the Great Plains and a short-lived increase in bison numbers, the Comanches were able to enjoy a (literal) Indian summer. A new era of raiding in Texas partially restored the Comanche position there; in two years of devastation Texas lost 4,000 horses, 30,000 cattle and hundreds of human lives. But in 1871 the United States finally unleashed its military might on the Comanches. The US Cavalry wore down the enemy by dogging them so that they had no time to pasture and tend horses, hunt buffalo, dry meats or prepare hides. The coup de grace came when white buffalo hunters poured onto the plains. In just two years they slaughtered 3.3 million bison. The once proud Comanches ended up on tacky Indian reservations. Sounds a bit more impressive than the Yapese Empire, though probably shorter-lived. Scores of African rulers who resisted colonial rule died in battle or were executed or sent into exile after defeat. Samori of the Mandingo was captured and died in exile two years later; the Asantehene, King Agyeman Prempeh, was deposed and exiled for nearly thirty years; Lobengula of the Ndebele died in flight; Behazin of Dahomey and Cetshwayo of the Zulu were banished from their homelands. In the concluding act of the partition of Africa, Britain, at the height of its imperial power, set out to take over two independent Boer republics, the Transvaal and the Orange Free State, and incorporate them into the British Empire, assuming that a war of conquest would take at most a matter of months. It turned into a gruelling campaign lasting three years, required nearly half a million imperial troops to finish it, and left a legacy of bitterness and hatred among Afrikaners that endured for generations. Faced with guerrilla warfare for which they were unprepared, British military commanders resorted to scorched-earth tactics, destroying thousands of farmsteads, razing villages to the ground and slaughtering livestock on a massive scale, reducing the Boers to an impoverished people. Women and children were rounded up and placed in what the British called concentration camps, where conditions were so appalling that some 26,000 died there from disease and malnutrition, most of them under the age of sixteen. All this became part of a Boer heritage passed in anger from one generation to the next, spawning a virulent Afrikaner nationalism that eventually took hold of South Africa. Small-scale revolts against colonial rule continued for many years. The Baoulé of Côte d'Ivoire fought the French village by village until 1911; the Igbo of Nigeria were not fully defeated until 1919; the Jola of Senegal not until the 1920s; the Dinka of southern Sudan not until 1927. In the desert wastelands of Somaliland a fiery Muslim sheikh, Muhammad ’Abdille Hassan, dubbed by his adversaries the 'Mad Mullah', led Dervish warriors in a holy war against the British for twenty years until his death in 1920. Bedouin resistance against Italian rule in Libya ended only in 1931 after nine years of guerrilla warfare. By the 1930s, however, the colonial states of Africa were firmly entrenched; they had, moreover, acquired a legitimacy in the eyes of their inhabitants. The open spring wagon, the utility vehicle with one seat and a hauling space in back, has a wide variety of local names. In Holmes County, Ohio, it is a "Hack"; in Arthur, Illinois, a "Buckboard"; in Dover, Delaware, a "Durban"; in Adams County, Indiana, a "Johnny wagon"; in Daviess County, Indiana, a "Long John"; and in Aylmer, Ontario, a "Democrat." A recent style of spring wagon, featuring an open bed or long storage compartment in back and an enclosed driver's seat will be referred to as a "cab wagon" in this book. In Pennsylvania a carriage-like vehicle with heavier suspension on the rear axle is called a "market wagon" or "peddle wagon." A number of vehicles used by the plain people are somewhat out of the scope of this book. These include heavy farm wagons and other agricultural vehicles. The special wagons designed to transport benches from one Amish meeting place to the next are found in each Amish church district. In Lancaster County the Old Order Amish and Mennonites make use of specially designed hearses. In Holmes County vehicles resembling a cab wagon transport the coffins. Sleighs, cutters, and bobsleds are rarely used in most communities and are not of any special style. Few new snow vehicles are produced. Enough antique vehicles are around to serve the limited demand. As the haggling in Europe over African territories continued, land and peoples became little more than pieces on a chessboard.... Britain traded the North Sea island of Heligoland with the Germans for Zanzibar, and parts of northern Nigeria with the French for fishing rights off Newfoundland. France exchanged parts of Cameroon with Germany in return for German recognition of the French protectorate over Morocco. By the time the Scramble for Africa was over, some 10,000 African polities had been amalgamated into forty European colonies and protectorates. Thus were born the modern states of Africa. 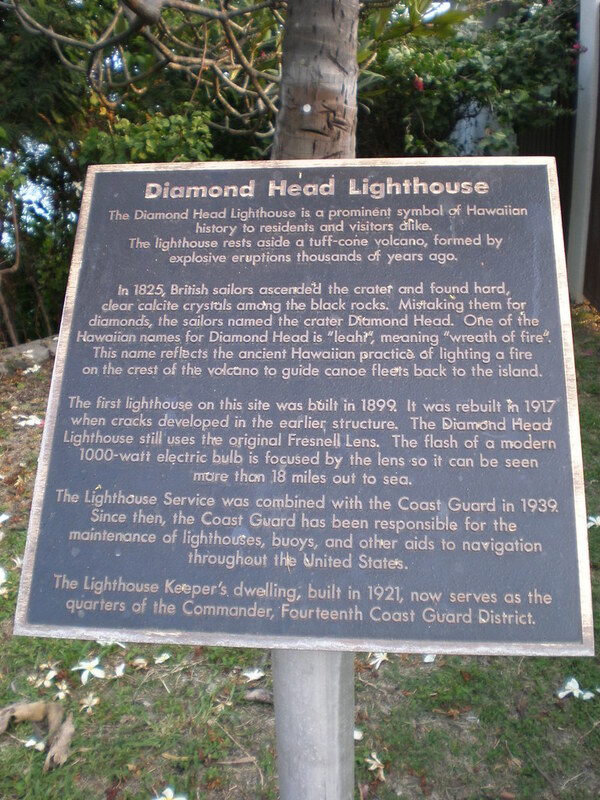 Most people who have lived in Hawai‘i for a while know that Diamond Head crater got its English name from the sparkle of worthless crystals in its rocky exterior, and not from real diamonds. And many know that it got its Hawaiian name, Lē‘ahi, from the resemblance of the crater's ridgeline to the dorsal fin of a tuna. But the name doesn't exactly mean 'dorsal-fin of tuna'. 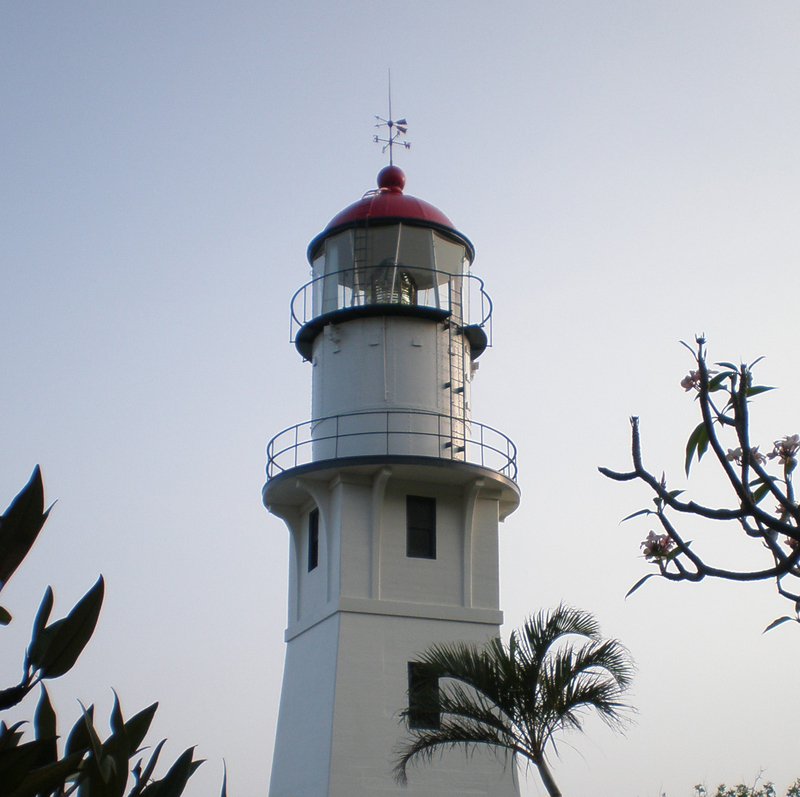 I gave the etymology a closer look after finding a bogus etymology on the historical plaque that marks Diamond Head Lighthouse. Lē‘ahi does not come from lei 'wreath' plus ahi 'fire', and thus has nothing to do with Hawaiian practices of navigational bonfires imagined by the builders of the modern lighthouse. Haw. ahi 'fire' comes from Proto-Polynesian (PPN) *afi 'fire', a good and widely reflected Austronesian root. In Numbami, a language I studied in Papua New Guinea, the word for 'fire' is yawi (with the /w/ slightly fricative before front vowels). Even highly aberrant Yapese seems to have a cognate, nifiy 'fire'. But Haw. ‘ahi 'tuna' comes from Proto-Nuclear Polynesian (PNP) *kasi (with *k > /‘/, *s > /h/), which seems not to be so widely attested beyond Polynesia. UPDATE: But what about Aku Head? There used to be a well-known radio personality in Hawai‘i who called himself "J. Akuhead Pupule" (= 'J. Tunahead Crazy'), reputedly after being called as much by irate listeners. I'm not sure why aku-head would be a sharper insult than ‘ahi-head, but it might be because aku is the Hawaiian name for the bonito or skipjack tuna genus Katsuwonus, whose name derives from Japanese katsuo, which in Japan is usually dried into a woodlike block, katsuobushi, from which flakes are shaved off for use as a flavoring. So maybe akuhead = blockhead. From my fieldwork experience long ago in Papua New Guinea, where I elicited far more fishnames than I had ever heard of before, I would guess that Haw. ‘ahi matches pretty well with the genus Thunnus while Haw. 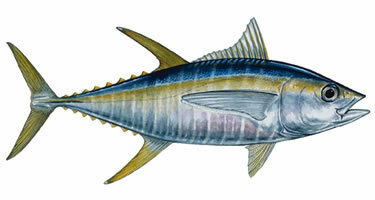 aku names tuna of the genus Katsuwonus (and perhaps a few other similar genera). In checking Wikipedia entries for other members of the family Scombridae (tunas, bonitos, and mackerals), I see that the one for wahoo, Haw. ono (< PPN *‘ono), offers entirely unsupported speculative etymologies for both names. Wikipedia should not confirm one person's speculation with that of another. Leave that to the news media. UPDATE 2: The cape at the southwestern tip of O‘ahu—a long, flat counterpart to Lē‘ahi at the southeastern tip—was for a time called Barber's Point, but has now reverted to its Hawaiian name, Kalaeloa 'The Long Point'. A reader asks why I don't simply consult a fluent native speaker of Hawaiian. One reason is that native speakers with encyclopedic knowledge are extremely rare in any language, but especially for Hawaiian these days, where most fluent speakers learned the language in a classroom, not from their parents and grandparents long resident on a plot of land. (In fact most have lost the lands of their ancestors.) Another reason is that local residents are usually content to offer folk etymologies and wild guesses when asked about anything not utterly transparent linguistically and historically. At least that is my experience from incessantly asking just such questions of local drivers, store clerks, wait help, baristas, sushi chefs, and random passers-by in my travels to odd parts of the globe over many years.